On a quiet, balmy Friday evening, my toddler is standing on our back deck taunting the neighbor's dog. He shouts, "Haw-lee" over and over. The really interesting part is that he's pulled his pants down and his diaper off, so he's basically sexually harassing the poor dog. My husband and I laugh, a little freaked out. "That's what we get for having boys," my husband says. I was pretty surprised because I bet my husband never acted like that as a child. 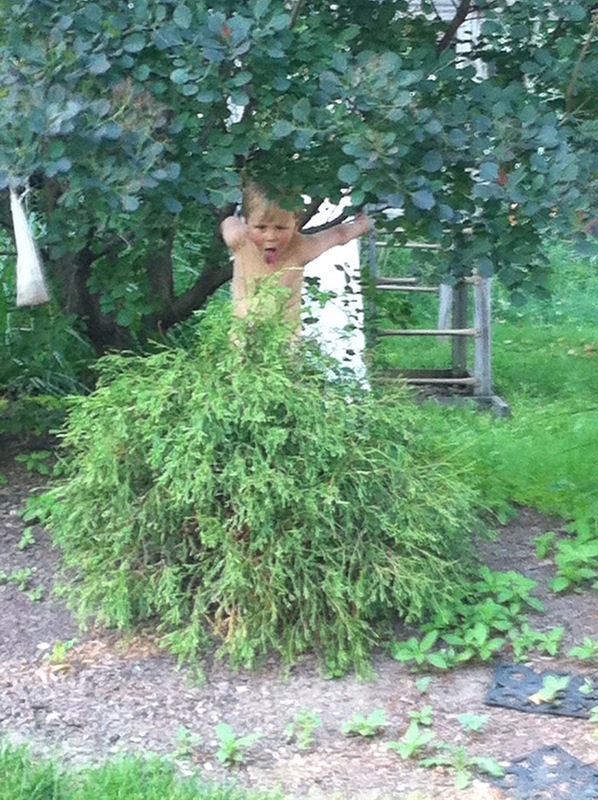 The toddler isn't the first of our children to scamper around our backyard au natural. Some of our neighbors were lucky enough to be blinded by the bright white skin of D one warm day. Is this really a boy behavior? I don't have girls so I don't know a lot about what girls do and don't do. Maybe it's just a behavior my children exhibit. We try pretty hard not to label toys or activities as "boy's toys" or "girl's books." My middle kid is really into Hello Kitty and Disney princesses right now. He wants Hello Kitty bandages and coloring books. I stress the gender neutral phrase, "kid's toys" as these items slide down the check-out belt at Target, not just for my boys but for all the ignorant sexist parents around me. Liking Disney Princesses just means my four year old is really, really susceptible to the Disney marketing machine. He is also raring to get hitched. D. can tell me which girls in Pre-K wear the prettiest dresses and informed me that when he marries one of those girls, I have to move out of our house so he can live with her. I let him know there would probably be another house on our block that he could buy. Somehow he seemed really surprised to hear that.